Black Pond lies down the road from Paul Smith’s College. Photo by Mike Lynch. A choice passage in Curt Stager’s new book Still Waters: The Secret World of Lakes puts the author and a group of his Paul Smith’s College students in a remote spot near Lake Baikal, deep in the wilds of Siberia. With his charges nearby but otherwise occupied, Stager wanders off alone and blunders into some rough-looking men. His hackles rise. “Their outfits were filthy, their faces were unshaven, and they outnumbered the adults in our party two to one,” he writes. On his guard, Stager lets himself be persuaded to join them. The only word the men utter that makes sense is “Amerikanski!” Then one of the rough characters scribbles something on a curl of birch bark and hands it to him. It’s a chemical formula, the one for ethyl alcohol. It so happens that the men are scientists, fellow truth-seekers out on the job. All is well! Out comes the vodka, poured into makeshift cups. Science, Stager argues persuasively in this book, has the power to build bridges over the chasms that divide us. 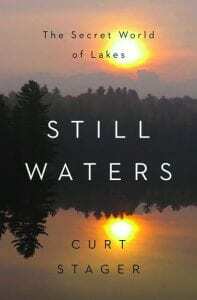 Still Waters brings the author, New York State’s Carnegie-Case Science Professor of the Year 2015, and his readers to lakes near and far. Some are as close to home as tannin-stained Black Pond, in the northern Adirondacks near Paul Smith’s, and Walden, in Massachusetts, perhaps the most celebrated pond in the world. Reaching out much farther, we also join Stager in studying and contemplating inland water bodies we have heard of since childhood (the Sea of Galilee, the Dead Sea, Lake Victoria) and lakes most readers will learn about for the first time, such as Lakes Malawi and Barombi Mbo, in Africa. The business of this book is probing beneath the literal and figurative surfaces of lakes to bring illumination and understanding. Stager, a consummate teacher but never a pedantic one, introduces us to a fascinating array of things that live in lakes: single-celled bacteria and archaeans, members of the taxonomic kingdom of Prokaryotes, which lack cell nucleii and whose presence in a biblically famous salt lake in the Holy Land prove that the Dead Sea is not really dead; cichlids, fish known to aquarium hobbyists the world over but encountered here in African lakes; tiny crustaceans called copepods and cladocerans; crocodiles; and more. I have spent a good deal of my own life gazing admiringly at lakes, boating on them, floating on them, fishing in them, leaping into them, and, back in the good old days of Adirondack camping before we worried about protozoans overwhelming our sphincters, drinking from them. Yet my knowledge of their workings and of the inconspicuous inhabitants that anchor their food chains has been sorely limited. Now, thanks to Curt Stager, I feel a little less in the dark and poised to learn a whole lot more. Stager demonstrates a strong ethical sense and a deep, well-argued faith in the primacy of logical, tirelessly questioning science over dogma, including scientific dogma. These qualities greatly enrich the book. 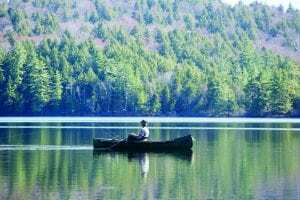 While I admire the majority of the excellent work done by the New York State Department of Environmental Conservation, I have long had concerns about the so-called “reclaiming” of Adirondack trout ponds. The idea is to save unique strains of “heritage” trout by eliminating non-native competitors such as yellow perch. The means is poison.